LA STAGE Alliance will be hosting an Open House on Saturday, November 10, from 5:00– 8:00 pm, to welcome its members to its new facilities in DTLA. The event will feature food, drinks, and music. To RSVP for the LASA Open House visit: https://www.facebook.com/events/176357729935180/. The new facilities are located on the fourth floor at 514 Spring Street in the heart of LA, in a historic theatre owned by the City of Los Angeles and operated by the Latino Theatre Company. 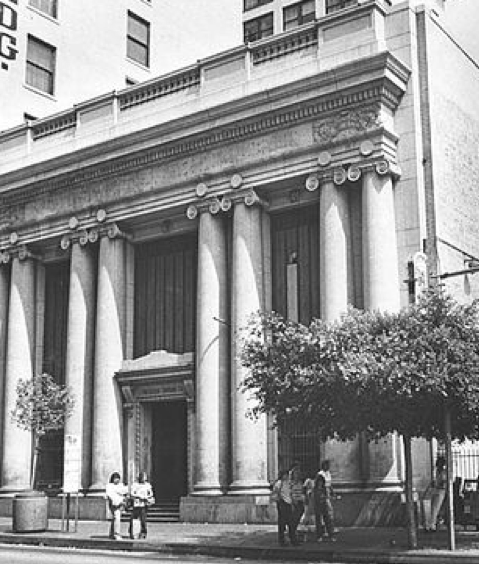 Constructed in 1916, the building was designed by John Parkinson and G. Edwin Bergstrom in a Greek-Revival style with Ionic columns. It is also known for its lobby, which has a large 50-by-100-foot stained glass ceiling supported by heavy ornamental bronze cornices and marble walls. Over the years the structure has been a Security Trust & Savings Building, a National Bank Building, and the President Trading Company. It became the Los Angeles Theatre Center in 1985. On the evening of the Open House, LA STAGE Alliance members may purchase $10 tickets for the Latino Theatre Company’s productions of Desert Rats and Members Only, which are now playing in the building. Curtain for both shows is at 8pm. Use code: LASTAGE10 at CHECKOUT. LA STAGE Alliance is a non-profit organization dedicated to building awareness, appreciation, and support for the performing arts in Los Angeles. LA STAGE is the go-to source for resources and opportunities for artists and arts administrators. LASA works with over 500 arts organizations across LA from the Ahmanson and the Dorothy Chandler Pavilion to the LA Theatre Group. LASA serves over 30,000 diverse arts patrons. LA STAGE Alliance produces The Ovation Awards, a yearly gala honoring excellence in theatrical performance, production, and design in Greater Los Angeles. The event boasts an average attendance of 1,200.